This week is for the birds! Birds of a feather truly do flock together—be they South American parrots, Polish chickens, native New Yorkers like herons and kestrels, or summer visitors like terns and egrets. For some odd reason, a confluence of avian-themed events for kids and families spans the boroughs this week. Here are a few to alight on. Squawk! Dominick Costa and his “sociable, people-friendly” parrots Kiku, Gingerman, and Señor (please, pregnant moms, don’t get any name ideas here) are either on the Fountain Terrace or near Le Carrousel every Thursday and Friday, depending on the weather. Drop by, interact, and discuss for several days post-visit; these jewel-toned South American parrots are sure to make a colorful impression. For a more formal introduction to our native urban birds, take an Audubon New York–led family walk through Brooklyn Bridge Park. 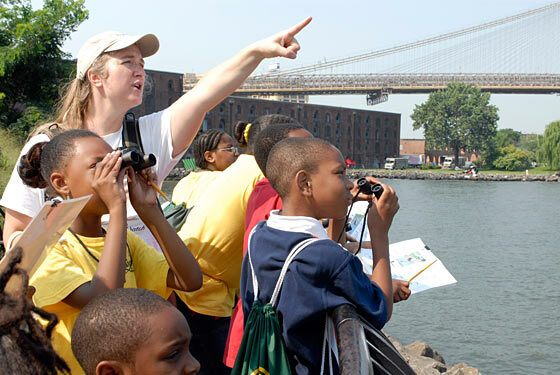 Moms, dads, and kids will learn how to use binoculars to spot species, and even how to identify common feathered New Yorkers and the birds that pass through on migration. BYO if you have them, but binoculars and bird checklists will be provided. Sign up in advance. If you’ve never witnessed the zoo’s aviary, fly—don’t walk! (Added value: the geodesic-domed bird house was designed by futuristic visionary Buckminster Fuller and exhibited at the 1964 World’s Fair in Queens.) Zoo staff will be on hand to take families on a “walk and talk” in the space. They’ll also show how to spot local specimens and make bird feeders. Apparently, our winged neighbors eat more than stale bread. Bryant Park Parrots: Thursdays and Fridays through 8/29, 11:30 a.m. to 2:30 p.m. Sixth Ave. bet. 40th and 42nd Sts. (bryantpark.org); free. Brooklyn Bird Watch: 8/15, 9:30 to 10:30 a.m. Brooklyn Bridge Park, 1 Main St., at Plymouth St. (718-802-0603, ext. 18, or brooklynbridgepark.org); free, reservations required. Queens Zoo: 8/18 to 8/22, 1:30 to 2:30 p.m. 53-51 111th St., nr. 53rd Ave. (718-271-1500 or queenszoo.com); free with admission.